As I have mentioned in previous posts, I am studying Spanish. I am also learning to play the ukulele. 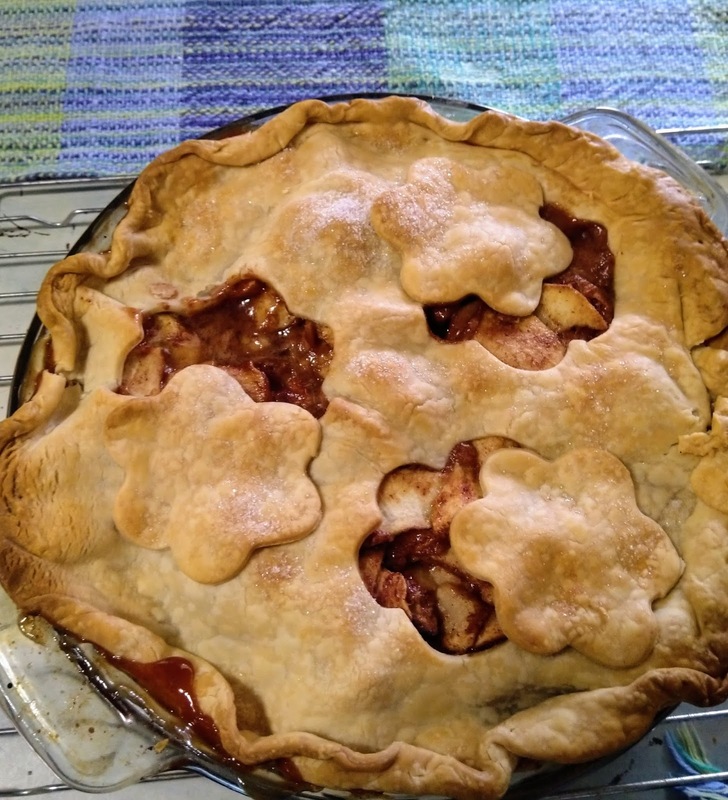 I have posted a song or two that I played and sang with the ukulele. So today I am going to tell you about my Spanish studies. In July, when I returned from my last trip to Mexico one of the kind ladies in my exercise class asked if I ever planned to go to Mexico again. I told her, "Yes, I love it there and want to live there someday." She said, "I have studied Spanish a lot but have lost my conversational skills from lack of practice. Would you like to meet a couple of times a week and study with me?" She told me that it would help her also. I quickly agreed. We meet twice a week in the hour before our exercise class. We are building vocabulary and forming sentences to describe random pictures that she has cut from magazines and laminated. This is surprisingly effective. I also discovered an online program called Duolingo. In my opinion, it is a great way to learn a language. The amazing part is that it is FREE unless you choose to pay. This program uses several methods to prompt learning. My favorite part is that you listen and type what is spoken AND you listen and repeat - and it marks your spoken word as either pass or fail. There are many other variations that you do also. The repetition and variations really help with the learning and retention. I took a few elementary education classes in college. So I know that this is effective teaching. Rewards are also a great motivator to learning. Here are a couple of screen shots that show my progress. 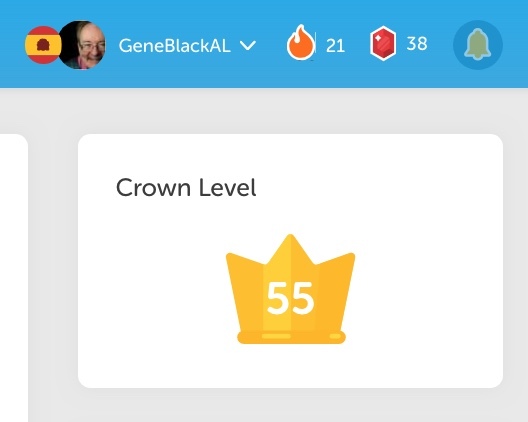 I have reached Crown Level 55 - which amazes me. I have no idea how high the crown levels go but 55 sounds good to me. 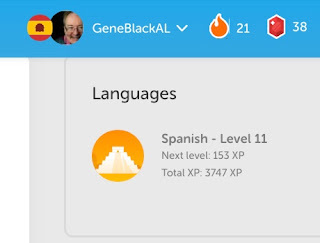 I have also reached Level 11 in the Spanish course with 3747 experience points. Both classes and "extracurricular activities" count for experience points. There are stories you can listen to in Spanish that have some interactive learning in them. There is also a Flash Card app called TinyCards -it plays right on my computer. Each of those earn experience points. Plus, the support the learning platform. What about real life application? I had a great experience Monday. Another lady in my exercise class is working with the local Christmas ClearingHouse. She said that I could come and help translate. I reminded her that my skills are not great. She said, "You know more Spanish than most of the people that will be working with us." So I went. I was surprised and happy to find that I was able to help a lot more than I expected. I was able to ask pertinent questions of the Spanish speaking clients and relay the proper answers. I discovered that knowing numbers helped a lot. I also used a word that I learned in our live Spanish class. When asked what toy a particular child would want, one lady said "Ella gustan un oso." My face probably looked strange at that point. She said "She likes a bear." I did the classic mime of a bear with a questioning look on my face. She grinned. I pulled out my phone and using the Google Translate app (which I highly recommend) looked up "teddy bear." I said "Oso de peluche?" She smiled and said "Sí" I told the interviewer and she wrote it down. Honestly, when I learned "bear" my thought was "I will never use this word." Ha! Now I know not to discredit the process of learning words that seem useless to me. So, even though I am not posting frequently, I am being active and learning new skills. If you happen to be taking a Duolingo class - or decide to try it after reading about my experiences with it - please add me as a friend. My Duolingo name is GeneBlackAL (just like it shows in those screenshots.) For the record, they have classes for many other languages also. The classes range from Chinese, Japanese to Russian, Ukranian and to Navajo and even Klingon! Plus, learning a language really keeps your brain active which is said to stave off some of the effects of aging. I made three more of the small stars for my wonky stars quilt top. This picture is far from being a good photo, but it will do. I also included the two large stars that I had not shown yet. 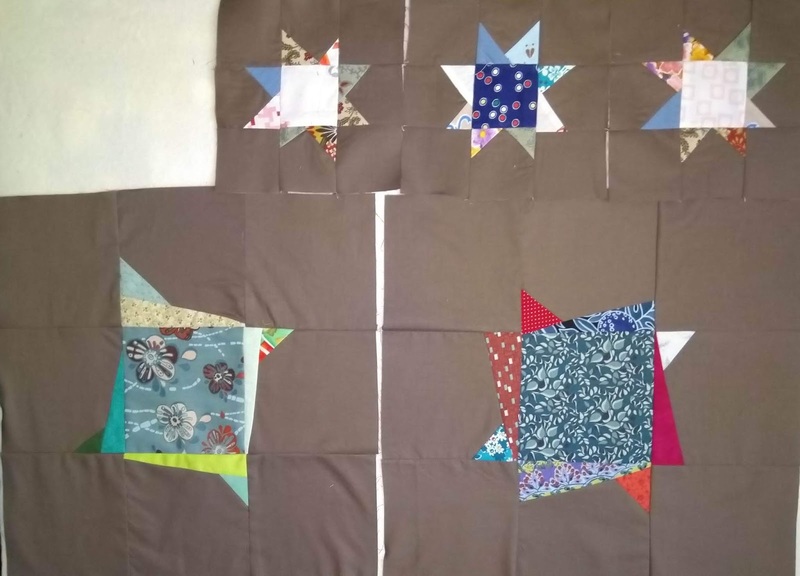 The larger blocks will be trimmed down to fit with the smaller blocks. 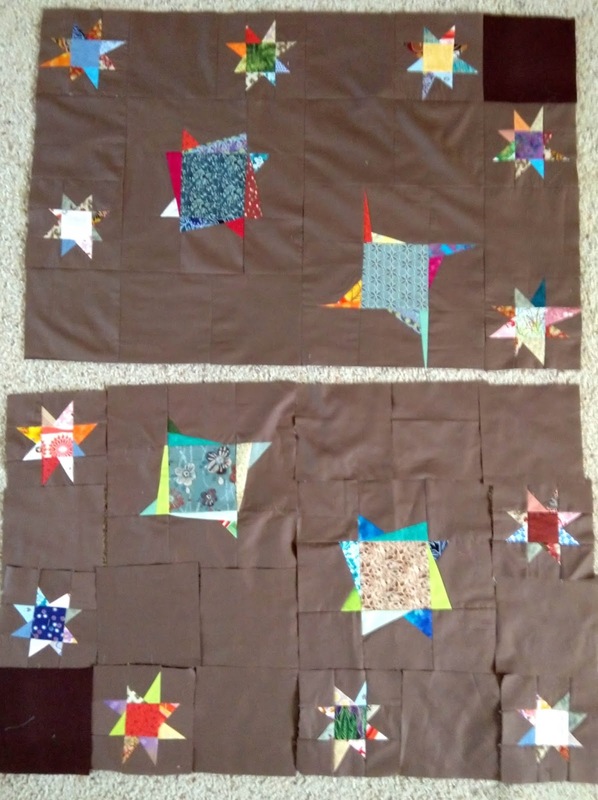 It will not affect the large star but there will be less of the background fabric around them. At this point, I have nine of the thirty-two small stars completed. So twenty-three more to go. I am afraid I will run out of the background fabric before I get all of the background squares cut. I am considering using random squares of color/design in the outer edges to give it a bit of a twist. My other alternative is to use a similar brown that is different enough to be noticeable. 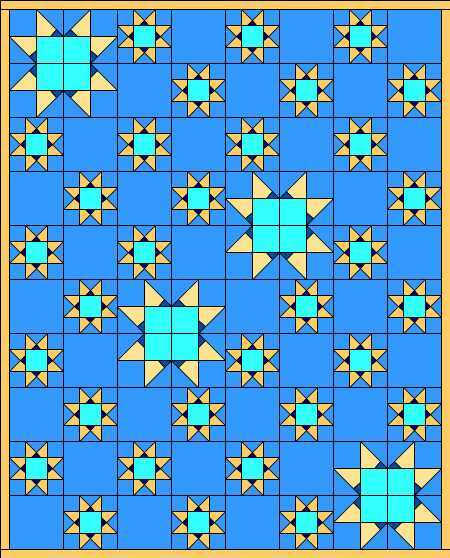 The other alternative is to replace the squares in the outer rows/columns (except the large star parts) with borders in a different color. I have also changed the layout to make sewing it together a bit easier. 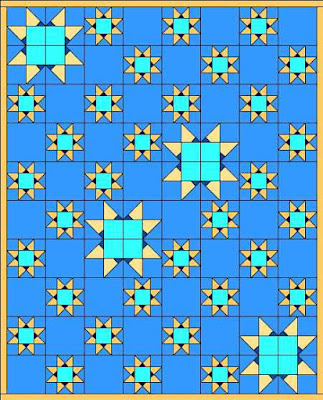 I can also move the top left and bottom right large stars in diagonally to make the outer edges all border fabrics.